The ultimate go-anywhere snack, Moose Munch® Premium Popcorn dares you to crunch and experience creamy peanut butter, rich chocolate, real butter, and gourmet popcorn in a way you never have before. 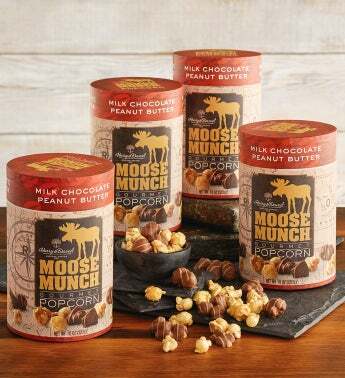 Moose Munch® Premium Popcorn blends all of these flavors expertly, handcrafted in the Harry & David® candy kitchen. Available for a limited time only in this four-pack set perfect for snacking. Make it part of your appetizer ensemble for the big game, or enjoy it anytime with friends and family.